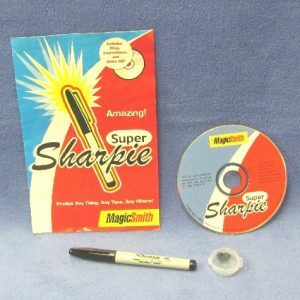 This trick combines magic, ESP and comedy. 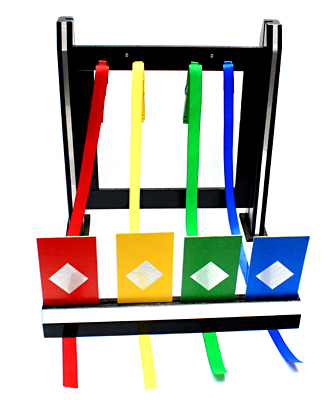 The magician displays a wooden tray containing four metal cards: red, blue, green, and yellow. He also shows a wooden frame. Clipped to the frame are four clothespins colored to match the cards. Hanging from each clothespin is a matching ribbon. The magician asks a spectator to select one of the cards from the tray while he turns his back. 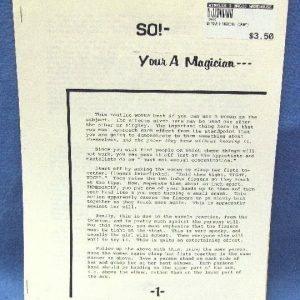 The magician (still turned around) asks the spectator to replace the card in the tray. Now the magician turns and points to the tray and asks the spectator to think of the card that he selected. The magician picks up the frame and holds it in front of him as he concentrates on the spectator’s selection; suddenly one of the clothespins flies straight up into the air with the ribbon flowing beautifully behind. Of course it is the clothespin that matches the spectator’s selection. You can also present this so all three of the colors not selected fly off the frame leaving just the selected color.